The charity has launched a new campaign, Be Dog Smart, to educate parents and children about how to be safe around dogs. A section on the charity’s website provides information and resources that can be downloaded, and the charity has been promoting the campaign on social media. The centerpiece of the campaign is an acrostic that provides 10 essential tips for young people, such as "beware of disturbing dogs that are eating or sleeping" and "remember all dogs have teeth". A recent study by Dogs Trust found that 44 per cent of parents would leave a child under the age of 11 alone with a dog, something the charity says should be avoided. Thirty-two per cent would let their child approach a dog they don’t know. However, the vast majority (89 per cent) were unaware that there are more than 20 signs that a dog is feeling uneasy and could become aggressive or bite. 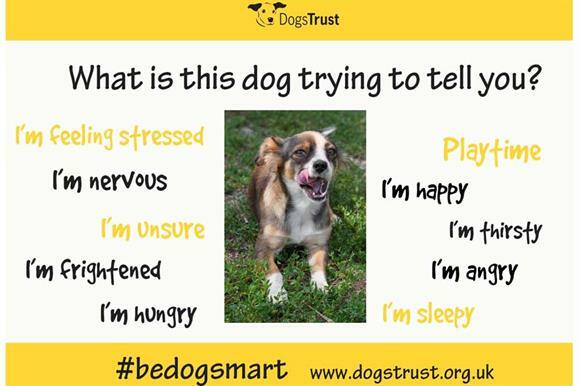 The charity has been tweeting messages about the campaign using the hashtag #bedogsmart. It has posted images of dogs with various expressions and asking "what is this dog trying to tell you?" The same images have been posted on Facebook, where people have left their guesses about how the dog was feeling. What does the charity want to achieve? The chief executive of Dogs Trust, Adrian Burder, says the charity wants its 10 tips to become a go-to guide for dog safety. "All children remember their Green Cross Code – we want Be Dog Smart to be just as well known," he says. "Our hope is that simple advice such as never leave your child alone with any dog, never tease a dog, don't approach a dog you don't know and always ask the owner before you approach a dog could prevent more dog attacks." A practical campaign with a strong message. The acrostic manages to get several pieces of information across in an accessible way that should be memorable for children. The exercise on social media was a good way to highlight the fact that it’s not always easy to tell how a dog might react when a child tries to play with it – this seemed to go down particularly well on Facebook, where people used the comments to speak about their own experiences of people approaching their dogs without checking that they were safe to do so.